Abcam’s IL-1β Human in vitro ELISA Set is designed for the quantitative measurement of IL-1β in cell culture supernatants, buffered solutions, serum, plasma and other body fluids. 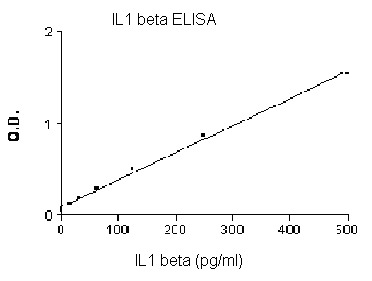 This ELISA Set is intended to measure human IL-1b in cell -culture supernatants, as well as in serum and plasma samples. The enclosed procedures provide general guidelines for ELISA preparation. This procedure may need some optimization depending on the plastic, matrix, standard range. The IL-1b ELISA Set includes both the capture and the detection antibodies as well as Horse-Radish peroxidase conjugated Streptavidin (HRP-Strep) and TMB which are the reagents used in the colour development step. Recognizes both natural and recombinant human IL-1b. Our Abpromise guarantee covers the use of ab47351 in the following tested applications. ab47351 has not yet been referenced specifically in any publications. Publishing research using ab47351? Please let us know so that we can cite the reference in this datasheet. What species does the antibodies in this kit come from? The antibodies of ab47351 are both monoclonals, raised in mice. 1. Are the ELISA plates supplied with the kits? 2. If yes, do the ELISA plates contain removable strips? 3. If no, do you have specifications for the plates we should use? 4. Do you have working protocols for these kits? 1) Our Elipair kits only contain the reagents needed to perform the assay, i.e. they include both the capture and the detection antibodies as well as Horse-Radish peroxidase conjugated Streptavidin (HRP-Strep) and TMB which are the reagents used in the colour development step. Unfortunately, ELISA plates are not supplied. 2) n/a. If you require kits including plates I may recommend ab108865 and ab108867, respectively. Click here (or use the following: https://www.abcam.com/index.html?datasheet=108865). Click here (or use the following: https://www.abcam.com/index.html?datasheet=108867). 3) We can recommend any polystyrene 1x96 well or 12x8 well plate suitable for ELISA. 4) Please find attached the protocols for ab48478 and ab47351. The suggested procedures may need some optimization depending on the plastic, matrix, standard range. According to the protocols we need 96-well polystyrene plates. Are these regular tissue culture treated plates? or special non-treated ones? Once again thank you for your kind help. For ab47351 you can use 96 well ELISA plates. I can recommend to purchase ELISA plates specifically. to ensure they are of the higher quality required. I am sorry wedo not sell these from Abcam, I can recommendto do an internet search to find some. ab48487 is a CRLF2 antibody that I am sorry is no longer available. Could you confirm the product code? I hope this will be helpful, and I look forward to hearing from you with regards to the second item.